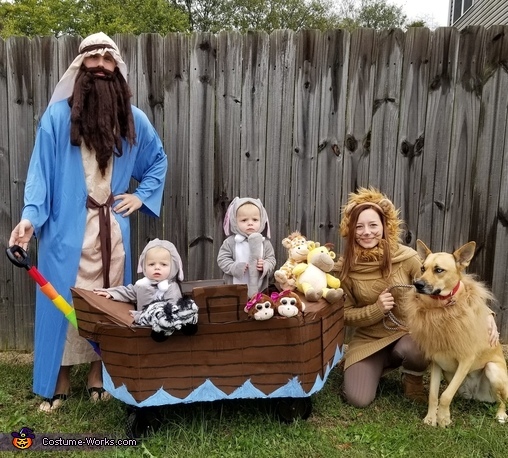 "They came two by two" My 1year old twin girls (elephants), my dog and I (lions), and of course my husband "Noah" with the hand made arc. I took cardboard, cut out two equal sized, boat shaped pieces and taped them to the side of the wagon. I then cut out the front triangle and back triangle out of cardboard and taped it to the sides. I spray painted it brown, then hand painted black lines and blue water. To represent the "rainbow" I took colored felt and fabric glue it onto the handle of the wagon. I bought 2 of every stuffed animal to top it all off. I love this. So creative! Very creative and incorperating faith. Love the theme and costumes. Just too cute. Such a great idea to include the entire family! Love it!